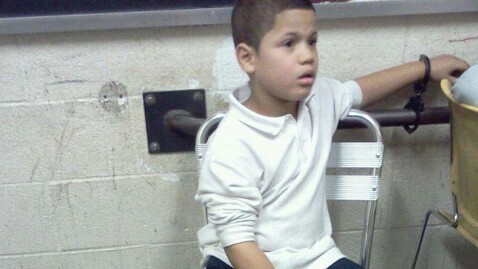 The family of a 7-year-old New York boy is suing police and the city for $250 million, saying cops handcuffed and interrogated the boy for ten hours after a scuffle over lunch money at school. The claim, filed by family attorney Jack Yankowitz, accuses the NYPD, among other things, of false imprisonment, physical, verbal, emotional and psychological abuse, and deprivation of Reyes' constitutional rights. Robbery charges against the boy were later dropped, and the NYPD, though it disputes the accusations in the suit, is investigating the incident. "While the lawyer's claims are grossly untrue in many respects, including fabrication as to how long the child was held, the matter is nonetheless being reviewed by the department's Internal Affairs Bureau," Deputy Commissioner Paul J. Browne told ABC News in an emailed statement. New York City Public Advocate Bill de Blasio was critical of the NYPD in a statement posted on the New York City Public Advocate's website. "Seven-year-olds don't belong in handcuffs," he said. "As a parent, I wouldn't stand for this in one of my kids' schools. Our school system's over-reliance on the NYPD as a disciplinary tool traumatizes our young people, sows distrust in our communities and drains vital city resources away from responding to genuine crimes. This has to stop." Calls placed to Public School 114 were not immediately returned.